The 4f-states in lanthanide elements are spin-polarized in many cases, and the majority states are located at below a few eV taken from the Fermi level. However, LDAs and GGAs cannot describe the feature of band structures for those materials. Although one way is to perform the plus U method by introducing on-site Coulomb repulsion for the 4f-states in such a case, OpenMX provides a simpler way that the spin-polarizaion of 4f-states is taken into account via a pseudopotential, so-called open core pseudopotential, while a few open core pseudopotentials are available in the database Ver. 2013. The open core pseudopotential of a lanthanide element is generated by assuming that the 4f-states are a part of core states, and the partial core correction charge is generated so that the radial shape resembles well the charge distribution of the 4f-states. Pseudopotentials: Nd_CA13_OC.vps and Nd_PBE13_OC.vps stored in the database Ver. 2013 were generated in this way. 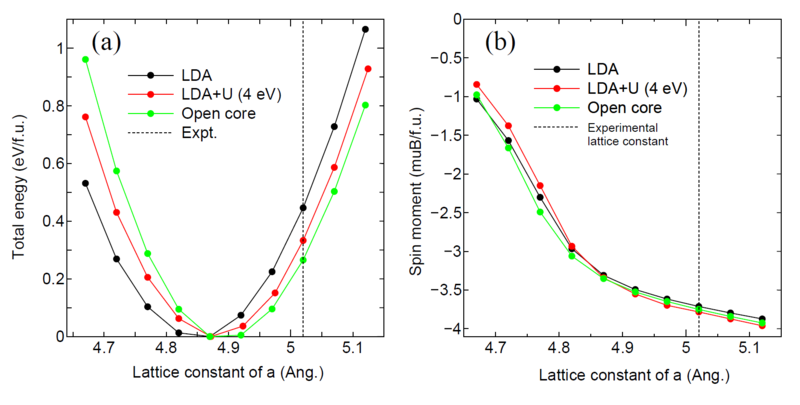 Figure 4: (a) The total energy of NdCo in the CaCu structure as a function of lattice constant, calculated by the LDA, LDA+U (U=4 eV for 4f-states), and open core pseudopotential methods. (b) Spin magnetic moment per the formula unit of the same system as (a). The input files used for the calculations are 'NdCo5_4f.dat', 'NdCo5_4f+U.dat', and 'NdCo5_OC.dat', which can be found in the directory 'work'. The example is for the NdCo calculation discussed above. The first column is the name of species which is defined by the keyword 'Definition.of.Atomic.Species', and the second is a flag to specify the spin direction, where '1' and '-1' mean that the partial core correction charge is fully spin-polarized upward and downward along the z-axis, respectively, and '0' means no spin-polarization. Using the keyword, one can control the spin direction of 4f states being open core states site by site. It is also noted that the open core pseudopotential is valid if the overlap between the 4f-states and orbitals in the neighboring atoms is negligible, and if the occupation of the 4f-states is not largely different between the pseudopotential generation for an atom and the states in compounds.